just tried it. its not possible. if i donwload the newst version of mkisofs and copy it to the correct folder, iso creation (create iso script), won t work. i get strange error messages or nothing goes at all. this was also my first thought, also in the past, if i have had the first problem with mkisofs. no way. It's rather difficult to write to a DVD at grub4dos level. as the 2gb-problem occured first, see the depending thread, i searched for a mikisfos version to download. with the first downloaded mkisofs-cygwin?-version, this wasn t working. so can anyone please give a link, to a valid mkisfos version wich is working? then i can try the sugestion from cdob, with an actual miksofs versions. Edited by livedude, 15 April 2012 - 05:02 PM. just tried it. its not possible. Remove the dependancies in build script. Or use a relating updated cygwin version. Unfortunately version didn't survived last server update two weeks ago yet. ImgBurn author did declined rock ridge support in the past. No, it's not supported. A OS may require or not rock ridge extensions. *nix related OS uses rock ridge extensions. Previous posted menu.lst did contain relating parts. You have to test each part. Each part may work or fail. i faced again the problem, to start an win7-installation. A addional USB drive should work. Or nclude unattended part to DVD. Be aware: this prohibit a repair installation. sorry not possible for me. i am no scriptcoder. thank you for the other hints. if ithe problem is solveable with a mkisofs-version that works, then i can do it. if there must be changed something in the iso-build-script, then i can only do it, if i have detailed instrcutions. in the meantime i keep useing imgburn, to implement files/iso`s wich are bigger then 4gb. you have options for override for example the iso-restrictions. i get working/booting iso`s as result. i testet the mainparts (tried to start windowy), it works. otherparts of my compilation i have not testet yet, but if windows runs, wich is the hardest part, then propably my other apps will work too. p.s. : the wish to implement a win7-installation in my project, tops the knoweldge i have atm. maybe i find something in the future, with clear steps or something to do that. therefore i delay it. if i don t want integrate iso-files wich are bigger then 4gb, then i can still use mkisofs with the create iso-script. if it should be maybe important in the future, to implement such big files, then i take the img-burn workaround. that seems the best alternative atm. Edited by livedude, 15 April 2012 - 09:20 PM. in x86 you copy the content of the win7 32 bit installation-dvd/iso and in the folder x64 you do the same with the win7-64-bit-installation-dvd/iso. A Win 7 SP1 x86 x64 ISO image result 3.8GB size. Which parts do you add? In the past you prefered a original ISO image. Now there is a edited ISO image. Can we add files or include a driver (firadisk) to the edited ISO image? here is the result of the aio-creation is 4.3gb. the used win7-64-sp1 was original the used win7-32-bit was a little bit modified (slipstreamed sp1 to home premium and ultimate). maybe this explains the difference in size. i copied the content from the win7-dvd`s in drive to "mainfolder/x86 and x64). after that, i copied the batchfile from the link to the mainfolder and executet it. the rest was running automaticly. *hint: don t execute this batchfile from a filemanager. i did that first, and it wasn t working (not finding something). executete it directly in the mainfolder with a double mouse click or something. then it should work. if it did not, then you can still try to copy the needed files to the aio-creation mainfolder and executeing the script again. it needs only two files i think. one of them is imagex and something else (don remember what). yes, for the creation of windows-aio i installed waik. after that i played a backupimage back to my computer, becouse i don t need waik, normaly. In the past you prefered a original ISO image. yes becouse i didn t know nothing about the posibility to create an aio-windows7, wich contains all versions in one file and saves space. but it depends of course in what you are doeing what you prefer. also an untouched orginal win7.iso can be an option. its case depending what is the best option i think, but its allways good, to have alternatives. therefore i am glad that i found that out with windows7-aio. sorry, i don t know. maybe you can modify this little script from the link with the instructions. this looks also very ineresting. Thank you! Edited by livedude, 17 April 2012 - 12:36 AM. Yes, a simple fake slipstream creates bigger files. install Windows 7, add SP1 and remove SP superseded files. Sysprep and capture a new image. reg add HKLM\SYSTEM\CurrentControlSet\Control\FiraDisk /v StartOptions /t REG_SZ /d "cdrom,file=e:\zISO###\win7.iso"
reg add HKLM\SYSTEM\CurrentControlSet\Control\FiraDisk /v StartOptions /t REG_SZ /d "cdrom,file=D:\zISO\win7.iso"
Diskpart does not list a new drive. FiraDisk seems NOT to mount a ISO image from a DVD drive. not sure about that becouse my winxp-installation also uses firadisk. its an xp.iso on dvd/virtual-iso in vm. Edited by livedude, 19 April 2012 - 11:18 PM. This loads WindowsXP-Home-SP3.iso to RAM. FiraDisk reads the RAM disk, FiraDisk does not read DVD that way. Do you intent to RAM load the 4.3 GB Windows 7 ISO image too? yes, thought about it. but then you need over 4.3gb of ram to load it, or isn t this the case? but then you need over 4.3gb of ram to load it, or isn t this the case? Yes, that's it. It's a strange approach. ImDisk reads a ISO file from a DVD. More than strange, "queer", I would additionally say SLOW. How long would it take to load a whole 4.3 Gb from DVD to RAM? thank you very much cdob for your work with this detailed instructions! but this is no solution for me. i can t presuppose an amount of 4gb ram on each computer i have to do. some words about workcases i have to do. i have a large amount of friends, good friends and not so good friends. they have different jobs and different hobbys. but each of them also has a computer. the most of them have not much knoweldge about computers and if a problem occur, they call me. becouse they are friends, i try to help. i ask them bevor i visit them, what exactly isn t working? already this isn t an easy task becouse many of them can t answer this. already the question wich o.s you are useing?, can not every of them answer correctly. the standard answer is windows. if i ask then, wich windows?, it often happens, that i get an "i don t know" as answer. becouse i don t know what is exactly to do and becouse i can t debar, that i must install the o.s new, i must cary every time a large amount of cd/dvd`s with me. win7/win-xp/install-mediums, different tools on cd and stuff. also therefore my project was createt, that i have in this cases only one medium with everything i need, that i can work. so it would be also a great benefit to have a possible win7 installation in my project, so i prepared for each case. that was the thought behind my project. this win7-install thing is atm not solveable for me. 4gb of ram that it is working, is no option. if this win7-installation would be possible if i don t do it with an untouched/aio iso, then i also be open for it. as long as it works, i have no problem with it. in the meantime, i delay this win7-installation-wish, till i find a usable solution for that. thank you very much to all of you for trying to help me with that. Edited by livedude, 22 April 2012 - 01:27 PM. Consequently, a DVD is - set aside the issues you are having with making one - the LEAST compatible media you might want to have. And let me assure you that in my experience I have seen more non-fuctional (at least for booting) DVD drives then I might have liked. Please find attached an easy to read table (with absolutely FAKE data I just invented ) based on an hypothethical population of 1000 (one thousand) PC's in the hands of "average" end users (in the "computer illiterate" segment), in the UNprobable guess that - by pure chance - ALL optical drives are fully functional. So if you do like all the rest of the world does, i.e. you carry a couple of CD's with the oldest OS's and a couple USB sticks with all the newer ones and you cover the whole range of possibilities. If you carry with you a DVD you cover at the most 77% of the range (unless you carry with you also a USB DVD drive for the netbooks that don't have one). Approach uses ImDisk. That's not FiraDisk. Read again: ImDisk reads a ISO file from a DVD. Approach does NOT use map --mem. That's a low RAM approach. Approach works at 512MB RAM machines basically. Well, installing windows 7 to such machines is another question. Do not use new approaches. Do not add a ISO image to a DVD. Use classic solutions working since a lot of years. But you don't have to squeeze all to one DVD. Create several different DVD. A dual layer DVD is a broken approach at unknown hardware. It's solved already. You prefer to ignore it. no i can t agree to this, absolutly not. i have complete other experiences. a large range of "these old" computers weren t capable of booting from usb, but each of them were capable to boot from cd/dvd. so a cd/dvd is much more compatible then an usb-stick! sorry Wonko i have oposite experiences. i have meet many computers wich weren t capable of booting from usb, but with cd/dvd booting was no problem. thanks for the attachment but it says not much. long not all computers wich have usb can also boot from it! well this isn t very comfortable to cary so much stuff with, but i also see no other way, for having the best compatibility. did you mean with this these devices like also zalman produces? : usb devices with a virtual drive emulator? sure, it was my mistake, sorry. but can you not try to say this a little bit more friendly? i re-read your instrcutions and did what you wrote and...it seems to work! absolut great work! how did you found that out? i thought no one did that bevor? but i also keep the sugestion in mind, to build also flat windows for better compatibility. i also plan to extend my project to an usb stick, wich i also cary with me. then i should prepared for the most situations. thank you a lot for sugestions and help and for the great working detailed enduser-compatible instructions!!! Edited by livedude, 22 April 2012 - 08:45 PM. the first try with cdob instructions worked fine. for testing purpose i tried it first with an normal win7-install.iso not the aio. then i thought everything is ready and build the final project and implementet the 4.3gb win7-aio. becouse of the bug of mkisofs whatever, i used image burn for the iso creation becouse of the 4.3gb big file. so, i went back to build the iso again with mkisofs and winbuilder and replaced the win7-aio against a normal win7-install.iso. same result. 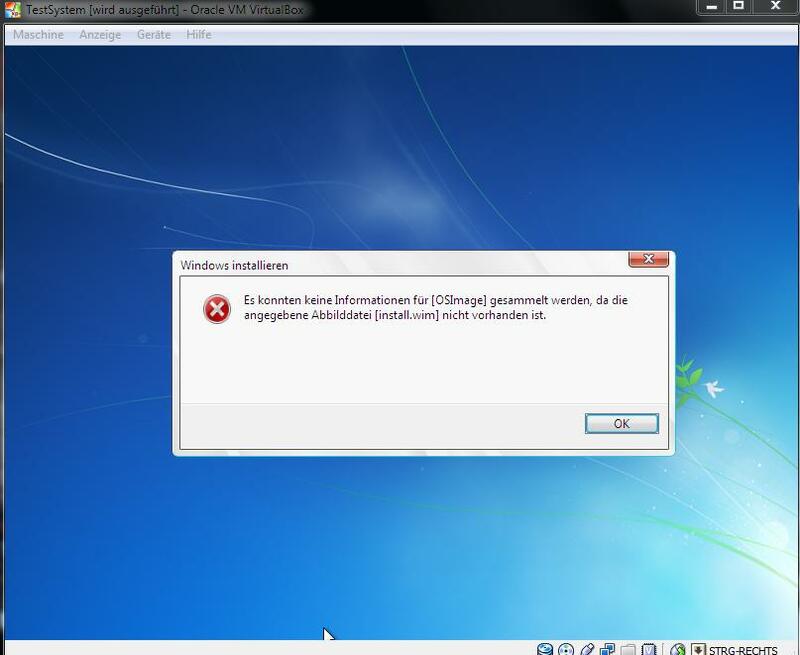 this error repaets also with winbuilder and mkisofs. the first try with the cdob method was so great and it was working. i don t know what is happens becouse its not working again. no clue. i am behind it. i hope i find the error. Edited by livedude, 23 April 2012 - 10:35 AM. In case you haven't noticed, a CD is NOT a DVD. A CD drive can read CD's (and NOT DVD's). A DVD drive can read BOTH CD's AND DVD's. A device not being able to boot from USB is likely to have a CD drive (and NOT a DVD drive). For a number of reasons it is MORE likely that a (partially defective) DVD drive can read CD's BUT NOT DVD's. It is NO problem whatsoever to have a CD capable of initiate the booting and continue the booting from USB on those very few machines that do not have USB booting in BIOS, the fact that you weren't able to boot from USB on any given number of machines simply means that "you weren't able to boot from USB" AND NOT that those machines are unable to boot from USB (and yes a few machines/BIOSes are pesky ). Of course you are perfectly free to do your multi-mega-AIO, what I was pointing out was that (once you will have succeeded) the result won't be the "most compatible thing around" , or if you prefer, if you are doing it for fun, that's allright , pretending that you do that in order to have "larger" support capabilities is not accurate. so starting such an system from dvd/bluray, gives you a much better compatibility then to start it from usb. in some cases you can trick this old computers out, wich can t boot native from usb with an bootmanager called plop-bootmanager. but for starting this plop-bootmanager on these older computers, you need anyhow, in any case a cd/dvd/optical medium on wich it is and if you need anyhow, in any case an optical medium, then you can also use it alike for the whole live system. becouse you never know if it can usefull, i will try to also create an usb-version from my project. Edited by livedude, 23 April 2012 - 11:12 AM. so it seems i have a little problem. i first create a boot.wim project (boots directly into ram boot). i make an iso with no starmenu from it. if you start the boot.wim.iso, its directly loading winpe into ram. then build single boot without grub4dos (first, i re.change that later). after this project is build, you see it on the last screen, i implement my iso`s to it, change winbuilder to grub 4dos and multiboot. then it is working without this bsod. so i can only make an iso for booting with boot.wim project, createt as iso to start without bootmenu directly. if i try this with the direct-boot-project (windows folder in root, look at screen two) and make an iso from this, wich i try also to start directly as iso, then this bsod apears. Edited by livedude, 23 April 2012 - 11:55 AM. Thank you for the hint patch! you can choose the attached usb-stick from bootmenu, but then its not boot from it. maybe that is such an case for trying an alternative creating method for usb-stick. if i try to build first a direct boot windows (wich is in windows folder) and make an iso from this, wich i implement in my project, then i always get at booting an bsod o7. Sure of course there is a BSOD 0x7b. There is no active driver to read the ISO file: hence the BSOD. but i don t found a solution till now. Why do you like to load PE3 flat files from a ISO image at DVD? Most likely nobody did this before. Which workarround? Flat files are nice at flat file booting. WIN7.ISO files is greater 4GB, final ISO image builded with mkisofs of course. The pause was included as a debug option. Now you may edit \imdisk\mountISO.cmd and remark the pause. Did you boot any real hardware so far? Does dual layer DVD boots in real life? There could be additional BIOS limitations out there, it's untested ground. How much RAM do you expect? I would assume 512MB RAM at machines booting from DVD and not booting from USB. Which Windows 7 systems dosn't boot from USB? Can you name some motherboard examples including BIOS revision? title Win7PE_SE (Windows7-Live-System/In Ram-Boot/Min. 800MB Ram! sure, as often i can, i test my project in the field. Does dual layer DVD boots in real life? not testet yet, becouse i am hanging on the spoken problem. maybe i can use your imdisk-method also for the xp-installation. not tried it yet. i don t know. never said something like this. but of course in theory, its also possible to have an win7-system wich can t boot from usb. i try to keep that in mind, in case i meet the next computer wich can t boot from usb. if i don t forget that till then, i can maybe answer you that. Edited by livedude, 23 April 2012 - 08:39 PM.